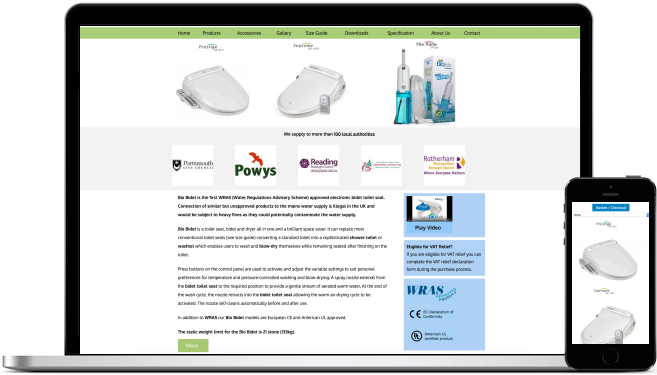 We were approached by the UK's exclusive distributor of an Electronic Bidet brand to re-design and update their website and develop an bespoke e-commerce system to handle orders for products with and without VAT relief / declarations. We started with analysis to understand their needs. Their previous website contained content which was not mobile-friendly and required a new e-commerce / payment system to be developed for an extended range of new products. In addition, the website had to be clear, straight-forward to use and very easy to navigate due to their customer base. It also needed to allow for online ordering / payment and provide reference material on the products they distribute. The website we delivered uses responsive web design, so it's mobile-friendly and allows more people to see and use the website than before. The new e-commerce / payment system has helped to convert more site visitors into customers.